The shortest distance between two points is not through Dropbox. With BitTorrent Sync, you can get directly from A to B without detouring through the cloud. That's the premise, so we took it for a test drive. Because it's a pretty compelling premise if you're moving photos or video (or any other file) between phones, tables and OS X or Windows computers. Sync runs on all of them. There is both a free version (limited to syncing 10 root folders with any number of subfolders) and a paid Pro version (you get a 30-day free trial before it reverts to the free version's limitations). The free version is especially important if you are sharing files with clients. But it may be all you need yourself. We ran Sync on an iPhone 6 Plus, iPad 2 (both running iOS 8.2) and two MacBook Pro laptops running Yosemite during the test drive. BitTorrent designs "distributed technologies that scale efficiently, keep intelligence at the edge, and keep creators and consumers in control of their content and data." It estimates that its "protocols move as much as 40 percent of the world's Internet traffic on a daily basis." The company is particularly famous for its peer-to-peer communications protocol or PeX, which reduced the need for and eventually eliminated central computers to connect users sharing files. Sync shares that approach in an easy-to-use interface that runs on any platform. You and your recipient don't need accounts at cloud services to access their services to share your files. Instead, you simply identify which files you want to share, how you want to share them and pass along an access key to who you want to share them with. In turn, the recipient installs Sync, uses the access key to find the files and very quickly has a local copy. When BitTorrent released Sync Pro we had no idea how much we needed it. But during the course of a day we do a lot of drag and dropping of files between external drives, remote servers and other devices. That's manual labor. And, you know, manual labor is so last century. Sync can directly replace file transfers facilitated with third-party servers like DropBox. The only caveat is that a cloud service is always available and the device hosting your files may not be. You may, for example, put your computer to sleep or turn it off, making the files inaccessible. 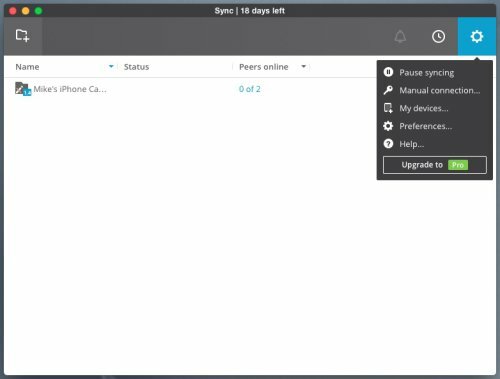 Sync can also perform backups between devices. The backup must reside on a different device (rather than an external drive, although there is some support for network attached storage devices that can install software). You'll want to specify something other than the default destination directory, however. Specifying a destination directory isn't as transparent as it might be but once you know the trick, it isn't difficult. Make sure your "My Devices" on peer B receives new folders in "Disconnected" state. Add folder on peer A. Observe it appears on peer B. Click "Connect" on folder line (it will be available as all folders on B now appear as "Disconnected"), it will prompt you for the folder you want to save incoming folder to. Fix the path manually if needed. Move the folder with your file manager -- Sync will track it if folder stays on same logical drive. The trick is that setting the receiving machine's state to "Disconnected" forces Sync to ask you where to put the synced files when you "Connect" the new folder. But by disconnecting any shared folder, you can reset the destination when you once again connect. It's an editable option. The Trick. Forcing Sync to ask for a location. We also set the shared folder with Read & Write permissions so it would be mirrored on both systems. And that worked well. In fact, with Sync running on both machines, we had a live sync going. As we moved files into the synced folder, they were copied to the other machine. And when we moved them out, they were deleted. But Sync was not going to help us with archiving our images to our MyBook World network attached storage device. We copy the originals from the camera card to a working directory named with the date and a identifying slug ("2015.03.10 Golden Gate Park" for example), converting the Raw files to DNGs and adding copyright information. We then copy that folder to an external drive attached to that computer (a second copy), to a network drive (third copy) and to another external drive attached to another system on our network (fourth copy). The original folder eventually gets burned to three DVDs as well. 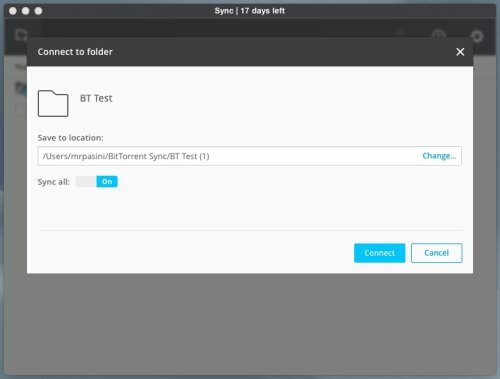 BitTorrent told us Sync doesn't allow you to sync to a different location on the same device. So we couldn't write our original copy to an external drive or to our particular NAS (which does not let us install any software). There are, however, versions of Sync for various NAS systems. Downloads are available for a variety of supported NASes. 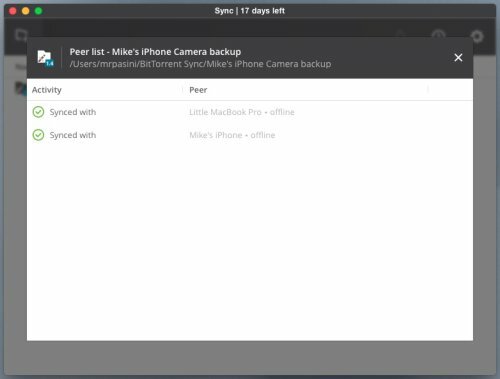 Sync's strength, then, is as a sharing app but it can do inter-device backups as well, even mirroring a directory structure. One sync we found particularly useful was facilitating a backup of our phone and tablet work to a desktop. More about that below. We downloaded the trial version of Sync Pro for our test drive. On the laptops, we went to the BitTorrent Web site to grab a copy. On the iOS devices, we went to the App Store and searched for "BitTorrent" to find the app. We were a little curious how we were going to move files between an IOS device, which does not have a file system, and our laptop folders and files. Fortunately, BitTorrent has very thorough online documentation to help answer any questions you might have. Strangely enough, though, we didn't read it before making our first sync. Which happened so fast, we hardly realized it. It all started when we launched the Mac OS X application and it asked us to pick a private identity or ID, suggesting a name it had parsed from our computer's ID. This is a permanent ID, so we were a little hesitant to proceed but "Mike" has worked for us for decades, so we went ahead. Sync. Main options are on the right-hand gear menu. The documentation (we later learned) suggests you connect all your devices right away so you don't get confused and establish (by mistake) a second identity. Operating on the principle that we'd better connect everything while we still remembered how, we just launched the application on the other laptop, pasted in the manual key we got from the version we first launched and connected it. We had to request a manual key, copy it to the clipboard, paste it into a text file and copy it to the other laptop. That's how you make a manual connection. Sync on iOS. Sending our iPhone photos to two laptops. But for the iOS devices it was magic. We were facing the second laptop, so we told it we wanted to connect a device, it displayed a QR code and we just opened the iOS app and pointed it to the QR code. Before we could aim the camera, it had connected the device. Sync Pro warns you it could take a minute to connect a device, but things went so quickly we weren't able to read the whole message. While we were still holding the iPhone, which was the last one we did, it prompted us to sync our photos. This turns out to be a built-in feature called Camera Backup (Mobile). You can disable it on the mobile device. Our workflow for iOS images is to cable connect the device (phone or tablet) to our main machine and use Image Capture to transfer photos to a temporary but watched folder were they are processed as we described above, adding a copyright and being moved into a dated and slugged folder for all eternity. The images are synced to iCloud but since they are deleted after transfer, they aren't up there more than a month or so. Wouldn't it be nice, though, to just have the images sync? So we told Sync Pro to sync the images on both laptops. And one minute later, all 129 of the current collection were on both laptops in their own folder in a BitTorrent folder in our home directory. Pretty fast. Pretty painless. And look, Ma, no hands! To share a folder you can either launch the software and use the Add button in the top left or use the contextual menu option to "Share Folder with BitTorrent Sync..." when clicking on a folder. The Folder Sharing panel allows you to set permissions to Read Only (the default) or Read & Write. Security options include approving any new peer, setting the link's expiration in days (three is the default) and setting a limit on the number of times a link can be used. You can then select the Email, Copy or QR Code button to create the link. Shared Folder. Selected to show menu on right. Now that the folder is shared, you can click on the button of three dots that appears at the far right (or just control-click for the contextual menu) when you select the folder in your list to view the Peer List. That shows you who is connected (assuming they've entered the link you sent them) and what files they need. Peer List. Ours are out to lunch at the moment. Sync copies all data in full. 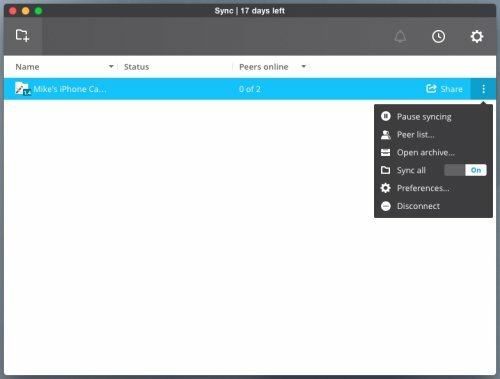 Connected or Sync all off allows you to access a folder, view its contents and pick individual files to sync, leaving the rest of them alone. Disconnected displays folders available for sync in Sync program window, but you can't see their contents and no data transfer happens until you switch to Connected or Synced. Nice to have the options. There's another factor to keep in mind, though. That's whether the system with the original files is powered up or not. Both systems have to be powered up for an update to take place. Sync will report any issue in that regard. It launches the application on boot. It allows for real time operations. When you change the name of a folder in the Finder, Sync Finder also changes it in Sync. If you move a folder in the Finder, Sync will follow that move and continue to Sync. Allows Sync to be added to the title bar to the left of the clock, which happens when you launch Sync. Provides contextual menu integration so you can right-click on a folder and select "Services>Share with BitTorrent Sync" to add the folder to Sync and share it with someone. Not having to rely on a third-party server to store your files is, in itself, a form of security. There is no Dropbox or Adobe or Apple server through which your files pass. They don't have to pass through your Internet Service Provider's server either if you are just transferring files on your local network. BitTorrent always puts your security first -- that's why we made Sync even safer than it was before. Instead of using keys like its 1.4-predecessor, Sync 2.0 makes use of an X.509 digital certificate, which ensures that such operations as adding peers, sharing folders, revoking access to folders, etc. are done in a secure way. SSL is used to provide security for peer data exchange over network. Sync keeps an archive of the files that were changed or deleted from remote devices. You can access the archive by clicking on the folder options button and selecting "Open archive." By default, items are kept in the archive for 30 days. This is Sync's versioning support. You can disable it in the Preferences settings for any particular shared folder. We won't pretend this is an exhaustive list, but to put Sync in context, we'll compare it to AirPlay and Rsync. On Apple devices, AirPlay may be a viable alternative for some of the things Sync does. But because it requires fairly recent Bluetooth hardware, a lot of perfectly functional machines just can't play. The Unix utility rsync, which can be managed with a graphical interface like Unison, can sync files between networked computers but not to a device or a computer not on your network. It can also, though, backup files to external drives, which Sync does not do. We haven't replaced any of our routine Unison scripts with Sync. But unable to use AirPlay, we've continued syncing our iPhone photos to two laptops with Sync. And every now and then when we have to transfer a folder of files to someone else, we'll resort to Sync rather than our FTP server (where we have to set up a private folder with its own password and explain how to access the server). For a more comprehensive look at other options see this list of synchronization software. The more we've used Sync, the more we like it. It handled our iPhone photos very nicely -- even before we knew what it was doing. And it made peer-to-peer file sharing very simple, too. But when we actually started syncing folders between two laptops, we really appreciated it. There, in real time, two systems were being kept up to date with no effort on our part. And with the safety of an archival versioning system. It would be nice if it could update an external drive for archiving. But that's about the only thing we miss. In fact, this is one test drive product whose keys we plan to keep.